дома » ARMENIAN - ENGLISH CONVERSATION GUIDE հայերեն անգլերեն զրուցարան » ՀԱՅԵՐԵՆ — ԱՆԳԼԵՐԵՆ ԶՐՈՒՑԱՐԱՆ: ԵՐՐՈՐԴ ՄԱՍ: ԳՆԵՐ: PRICES. 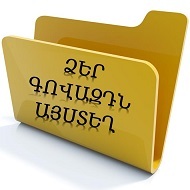 Ներբեռնել լավ որակով ( PDF) ԳՆԵՐ: PRICES. փրայսիզ: (էջ 147-154). բարձր չէ: We’d like hear your lowest prices. We are quoting our best prices. price if we increase the order? demand on the world market. We can’t agree to your price. find that they are lower. Here is our new price-list. buy smth. for a song; buy smth. Previous post: ՀԱՅԵՐԵՆ — ԱՆԳԼԵՐԵՆ ԶՐՈՒՑԱՐԱՆ: ԵՐՐՈՐԴ ՄԱՍ: ԱՊՐԱՆՔՆ ՈՒ ՆՐԱ ՈՐԱԿԸ: GOODS AND THEIR QUALITY. Next post: ՀԱՅԵՐԵՆ — ԱՆԳԼԵՐԵՆ ԶՐՈՒՑԱՐԱՆ: ԵՐՐՈՐԴ ՄԱՍ: ՎՃԱՐՈՒՄ, ԴՐԱՄ: PAYMENT, MONEY.